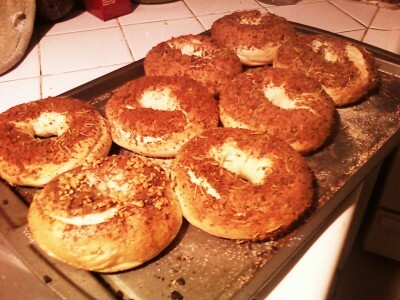 The grocery store in my new-ish neighborhood has lame bagels and I’m too cheap to get the good ones from the bagel place, so I tried 2 different kinds of homemade bagels. The easier one turned out great (and I don’t have preternatural abilities with baked goods). You can use this recipe below (adapted from the one here) or Emeril’s water bagels here; I’ve tried both, but I liked this one because its results turned out better for me, it involved fewer and easier steps, and Emeril’s wanted to be a bit too pretzel-like in the texture of the inside. No bueno. A bready bagel is a bad bagel, and Emeril’s were a little bready. That said, if you don’t want to have to knead a little, go with his version. 1. Mix all ingredients in a bowl. The dough should feel stiff, but if it’s unworkable and you can’t get all the dry flour to mix in, add a bit of extra water. 2. Drop the dough onto the counter and knead for about 10 minutes until uniformly smooth. Cut dough into 8 equally sized balls (or 12 if you are making soft pretzels). Set aside and let rest for 10-20 minutes. Preheat oven to 425 F.
→ My notes: I kneaded it in the same large Pyrex bowl where I mixed it, the bowl sitting on top of a dishtowel for stability. Use your knuckles to press into the dough when you’re kneading it instead of trying to work it with your fingers; keep turning it over and pressing the sides into the middle for the 10 minutes. I let the dough rest in its ungreased baking sheet under a clean cloth that I’d dampened slightly with hot water, then wrung out well. This helps make sure the yeast does its job. 3. Using both hands, roll one of the dough balls into a snaky shape. When it’s longer than the width of your 2 hands, wrap it around the main rolling hand, edges overlapping. Use your palm to squish/roll the two ends together. Repeat with remaining dough balls. → My notes: I put the pot of hot water / poaching liquid on the stove right before I started doing this and I would dip my finger into the water and brush it along the places where my bagel-ends overlapped to get it to stick fully and smooth out. 4. 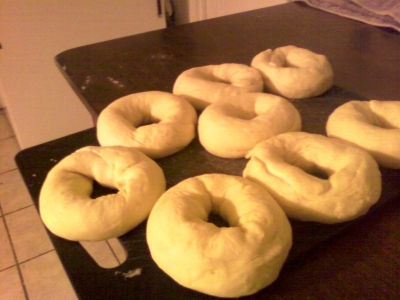 Let formed bagels rest on counter for about 20 min; meanwhile, bring a big pot of water / poaching liquid to a boil and grease a large baking tray lightly (a small splash of vegetable oil is fine for this). → My notes: I didn’t grease the sheet. A good nonstick sheet sprinkled with a little cornmeal worked out fine; these don’t really want to stick. If your baking sheet is dark, and / or you’re planning to put real, meltable cheese on these bagels, put parchment paper on the cookie sheet rather than greasing it — otherwise, you lose most of that lovely toasted cheese. 5. 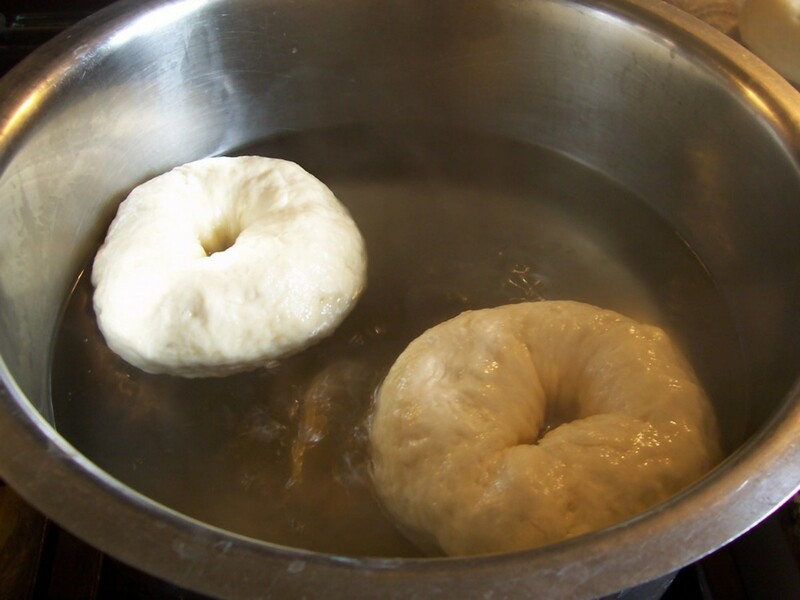 After the 20 minute rest, the bagels will start to look puffy; add as many as possible to the boiling water without overcrowding. Boil about 1 minute, turn over, boil for another minute. Remove and allow to dry for a minute or so. At this point, you can dunk their tops into a little bowl of whatever topping you want on them, unless it’s real cheese. → My notes: Important! 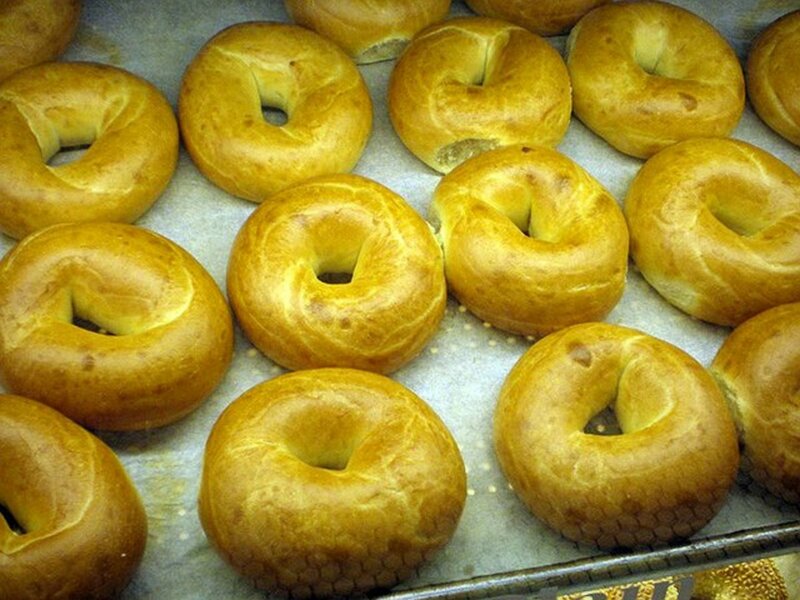 Bagels that are very resistant to floating are not ready – they need to sit longer, and this may mean your yeast is weak. Also important: If you’re not using the poaching solution, use a spatula to keep the bagels underwater while you boil each side; otherwise the outsides dry out and get wrinkly and ugly (see photo). 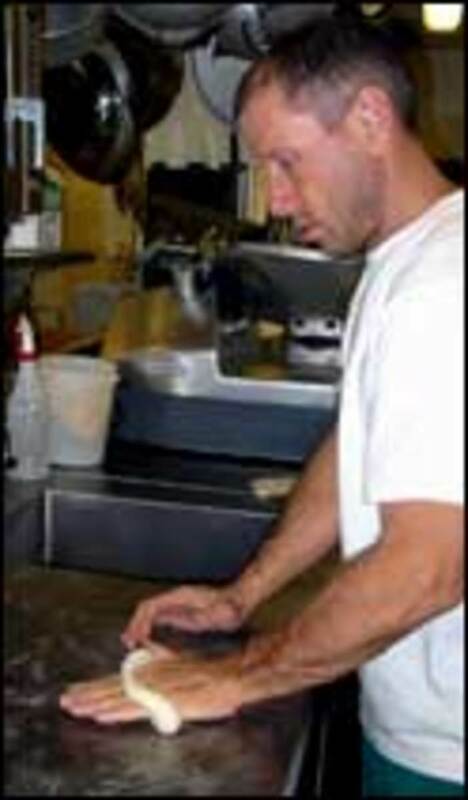 Professional bagel makers do huge batches in a massive boiling pot and use a big wooden paddle to push the bagels down so the bagels boil as they float up. That’s just not going to happen properly at home, even if you have a really big soup pot, so I used a medium-size saucepan and did mine one at a time, using a spatula to hold them just below the surface. At “one at a time,” 30-50 seconds per side is fine. → My notes: 7 or 8 minutes on a side (total of 14-16 minutes) is probably better, especially if you don’t turn them. I didn’t because I’m ok with the bottoms being inappropriately crunchy and don’t like losing my toppings. For bagels with shredded cheddar cheese on them, you CAN put the cheese on them before baking them at all, since the cheese seems to lock in the moisture and eliminate the need for them to be turned over anyway. However, it’s probably better to put the cheese on the former “bottom” of the bagel when you turn it over at the halfway mark. Which way is better will depend on your oven. 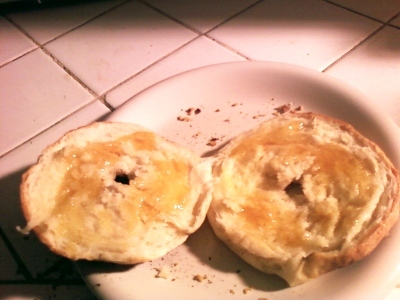 I had made one bagel with cinnamon and walnuts on it, so I opened it up and put honey on afterward. You can see the texture is still a bit bready, but not bad! Later batches that I kneaded longer turned out more dense, with the outsides shinier. After it cooled, the inside of this bagel was pretty much exactly how the inside of a good bagel should be.